The Lincoln Highway Association, the National Old Trails Road Association, and other groups with an interest in California tourism based a portion of their early promotion on the assumption that long-distance highway traffic would increase significantly in 1915 as motorists headed to the Panama-Pacific International Exposition in San Francisco and the Panama-California Exposition in San Diego. Carl Fisher had cited the Panama-Pacific Exposition in September 1912, when he told his automobile industry associates in Indianapolis about his plan for a coast-to-coast rock highway from New York City to San Francisco. With the $10 million he expected to raise from the industry, he planned to have the new road, soon to be named the Lincoln Highway, ready for travel so "a corps of 25,000 automobiles can be taken over this road to the opening of the Exposition in San Francisco either in May or June, 1915." The proposal was an ambitious idea that, with the help of an impressive public relations initiative, captured the public's imagination. As Fisher learned within a year, however, it was also an impossible task. He would not be able to raise $10 million from his auto industry associates or from any other source. Moreover, that amount would not have been enough. And if he had raised that amount, he did not have any means of using it to improve the roads that were connected to become the Lincoln Highway-much less to do so by May 1915. The National Old Trails Road Association and the Automobile Club of Southern California had begun an extensive campaign in 1914 to post signs on the National Old Trails Road to help motorists find they way to the expositions. They also posted signs on feeder roads from the Lincoln Highway to entice motorists to leave the northern route and take the Old Trails route to California. The expositions, which had been in the planning stages for several years, were intended to celebrate the opening of the Panama Canal. Water passage across North America had motivated North American explorations since colonial days, including Lewis and Clark's U.S. Army Corps of Discovery beginning in 1803. By mid-century, with no suitable transcontinental water route found, travelers could choose from three unsatisfactory alternatives. They could board ship for the long, dangerous voyage around the southern tip of South America. Alternatively, travelers could leave their ship at Nicaragua and cross the narrow Isthmus of Panama to the Pacific Ocean by a combination of land and river. This saved time, but travelers risked contracting Yellow Fever and other diseases. The third option, overland travel, became possible-just barely-in the late 1840's. The Panama-Pacific International Exposition, shown here in photographs that appeared in the September 4, 1915, issue of Good Roads magazine, was the focus of promotion by the National Old Trails Road Association, the Lincoln Highway Association, and others. The Gold Rush of 1849, with thousands of Americans suddenly bound for the west by all their methods of travel, dramatized the need for an alternative. This need was not fully satisfied by the first transcontinental railroad (completed at Promontory Point, Utah, on May 10, 1869) nor the Panama Railroad across the Isthmus (completed in January 1855, although the railroad had been carrying passengers and goods as early as 1851). Trans-ocean shipping needed a shorter way to move between the Atlantic and Pacific Oceans. A French company chose Ferdinand de Lesseps, builder of the Suez Canal (completed in 1869) to build a canal linking the oceans in the 1870's. The effort failed, doomed by Yellow Fever, expense, inadequate equipment, and de Lesseps' incorrect engineering judgments. During the Spanish-American War in 1898, the difficulty of moving U.S. Navy ships around South America for battles in Cuba, Puerto Rico and the Philippines convinced American officials of the military necessity of a shorter sea route. The need for faster communication became even more critical when these three former Spanish territories became part of the United States as a result of the war. The United States took on the job in 1899 with creation of the Isthmian Canal Commission. While plans for the canal were under development, Dr. William Gorgas of the U.S. Army demonstrated the cure for Yellow Fever in Havana, Cuba, beginning in 1900 (eliminating breeding grounds for mosquitoes, which transmitted the disease). This solution cleared the way for successful construction of the canal. Boosters in California's three major coastal cities saw the Panama Canal as a potential bonanza. With a population under 40,000 as of the 1910 census, San Diego was the underdog. Los Angeles (319,000) and San Francisco (416,000) were far ahead of their southern rival. Nevertheless, San Diego expected to be a principal port of call for the Atlantic-Pacific trade. Los Angeles, which had the same idea, annexed the port towns of Wilmington and San Pedro to try to capture the trade that would expand after the opening of the canal. San Francisco, still recovering from the devastation of the Great Earthquake and fire of 1906, also wanted to take advantage of the expected boom in trade. As the first decade of the 20th century advanced, the idea of a Panama Canal exposition was a common idea in several cities. In San Francisco, the success of the Louisiana Purchase International Exposition in St. Louis, Missouri, in 1904, the same year construction began on the Panama Canal, spurred thought of an international exposition to celebrate its completion. In the wake of the Great Earthquake, officials saw the exposition as an opportunity to mark the rebirth of their city. Officials of New Orleans, Louisiana, another city that was likely to benefit from the opening of the canal, also sought approval for an exposition. In San Diego, on July 9, 1909, banker G. Aubrey Davidson addressed the San Diego Chamber of Commerce with a proposal for an exposition in the city park. According to San Diego historian Richard F. Pourade, "This would not only provide for a major attraction but for park development as well" (Gold in the Sun, The Union-Tribune Publishing Company, 1965, p. 113). After learning of San Francisco's interest in a similar exposition, city boosters put their plans into effect as quickly as they could. On September 3, 1909, the same day that James McNab, President of the San Francisco Chamber of Commerce, announced that his city would hold an exposition to celebrate the opening of the Panama Canal, San Diego boosters incorporated the Panama-California Exposition Company. As Pourade noted, "San Diegans were aware that they could not compete with San Francisco in staging a world's fair and narrowed their ambitions to an exposition that would be regional in character" (p. 127). Delegates from the two cities met in January 1910, with San Francisco urging San Diego to drop its planned exposition. San Diego initially declined. However, in April, when New Orleans sought approval from the United States Congress for an exposition, the two California cities agreed on a compromise. On May 7, stockholders in the San Diego exposition company agreed to support San Francisco's bid for an international exposition in honor of the Panama Canal while holding a smaller exposition in San Diego based on the history and culture of Southern California. Assurances to San Francisco included dropping the word "international" from promotion of the San Diego exposition. In 1911, reportedly in return for support from San Francisco interests for his reelection bid in 1912, President William Howard Taft supported the city's bid to host the international exposition by inviting other countries to participate. San Diego boosters, who had been trying to secure Federal invitations to Mexico and other Latin American countries, felt betrayed by San Francisco's actions, but had little choice except to continue with their plans. The Panama-Pacific International Exposition, after three years of construction at a cost of $25 million, opened in San Francisco on February 20, 1915. After rejecting Golden Gate Park as the site, planners had chosen an undeveloped parcel of land on the bay next to the Presidio military base. The twin themes of the exposition were the opening of the Panama Canal and the 400th anniversary of the day that the explorer Vasco Nunez de Balboa became the first European in the New World to see the Pacific Ocean (in September 1513, Balboa had crossed the Isthmus of Panama and claimed what he called the South Sea for Spain). It featured exhibits from 20 States and 23 countries. The main buildings, designed in an "elaborate baroque Spanish-Mexican colonial style," lined a single street called the Prado. The site was landscaped to "create an abundant Mediterranean atmosphere." The Panama-California Exposition featured technological and industrial exhibits, a midway of live shows, and exhibits contributed by railroad companies seeking tourist business. However, it emphasized the "science of man" by illustrating the evolutionary progress of humans. The anthropologists worked out plans for a three-part presentation that would include separate exhibits on the physical evolution of man, the evolution of culture, and the native races of America. Although San Diego's population had increased to over 70,000 by the opening of the exposition, it had not attracted exhibits from other countries. Exhibits came from only six other western States. With two expositions in California, highway boosters assumed that motorists wanted to know about the roads to the State. Briefly and generally answered, from Kansas City westward until the coast is reached the road beds for the most part are dirt, with improved stretches ranging from a dozen or two miles [sic] to nearly three hundred. The best months for traveling by auto over the Lincoln highway, the Trans-Colorado or the Northwest Trail are from late in May until October. The Southern route, the National Old Trails, may be taken any month in the year. During July and August the heat makes the Northern route more desirable. Two routes are possible in returning east from San Diego, but if the Grand Canyon of Arizona is to be visited, the better way is to return through Los Angeles and take the National Old Trails road east to Williams. Here a good road to the Canyon is found and the return to the Old Trails highways is made at Flagstaff. The alternative, the Ocean to Ocean Highway from San Diego, would require motorists to depart at Phoenix to reach the National Old Trails Road at Ashfork. Noting the sign posting of the National Old Trails Road, he said that, "The Old Trails route is good traveling the year round so far as snow and cold are concerned." It is certain that all of the communities through which the transcontinental highways or their secondary branches pass have made strenuous effort to have their highways in the best possible condition for the California expositions year. Competition has been keen to direct their way on the part of cities, counties and states with the result that the user of western roads is the gainer as well as the communities themselves. No writer was better qualified than A. L. Westgard to judge the condition of the country's main highways to California. Westgard had been driving the western roads for years, long before the National Old Trails Road and Lincoln Highway had been formed by their backers. He had identified and mapped several routes, including the Trail to Sunset; no one had a more intimate knowledge of road conditions. He provided his views on "Motor Routes to the California Expositions" in the March 1915 issue of Motor. Yesterday we had the rough trails with unbridged streams and ravines, rocky and steep hills, deep sand or perchance mud and slush, poor or no accommodations for man or car, motor cars of crude design and unknown weakness, and, Presto! today, over night, we have well developed touring routes with fair and fast improving surface condition, bridges and culverts, easy grades, good, or, in most cases, at least, fair hotels, garages, plentiful supplies, and well designed all around dependable cars. Verily, life is decidedly worth while, after all. [On] every one of the five routes described in this article there still remains just sufficient lack of a semblance to park boulevards to ensure one of a chance to rough it to some extent, but it is my belief that a month's living out of doors, the ever changing scenery, besides acquiring a knowledge of our vast country, obtainable no other way, will add sufficient zest to the trip to forget and forgive any minor discomforts encountered. It was the first transcontinental route to have an organization created for its improvement, and that this organization has been a live one is amply evidenced by its energetic campaign for yearly betterments. [When] in traveling through arid desert regions, practically uninhabited, one finds graded roads, even though only built of the native soil, bridges over all streams and ravines, culverts over all ditches and washes, one cannot help but ponder over and admire the enterprising spirit shown by the states and counties through which one travels, hence the memory of the trip through New Mexico, Arizona and the Mojave Desert in California will linger long in your mind. After describing the historic segments that gave the route its name, Westgard commented that, "West of Kansas City the entire distance is well sign posted by the Automobile Club of Southern California in conjunction with the Old Trails Association and the counties traversed." Westgard then provided a detailed summary of road conditions. Motorists would find "good macadam through Philadelphia and Baltimore to Washington." Through Frederick, Hagerstown, Cumberland, Maryland, and Uniontown to Washington, Pennsylvania, "the road is mostly new and the route offers surprisingly good going." From Washington to Wheeling, West Virginia, the National Old Trails Road was mostly macadam; from Wheeling to Columbus, Ohio, the "surface is mostly pavement." Good conditions continued with "fine and mostly level graveled roads" to Indianapolis, Indiana, and "more gravel road" to Terre Haute. A sign along the National Old Trails Road east of Herington, Kansas, depicted a wagon train moving west, part of the heritage of the old trail. Potential problems began in Illinois, where a motorist would "encounter some stretches of clay, which according to whether there has been recent rain or not, will be merely rough or quite bad." With occasional relief from "hard surface pavement near the towns," the stretches of clay would prevail until the motorist reached St. Louis, Missouri. Across the state of Missouri will be found substantial concrete culverts and bridges, built preparatory to macadamizing the entire route. At present, however, there are still several counties where the clayey soil makes bad going when wet, though for the major distance will be found good macadam or well graded and dragged dirt roads, though somewhat hilly. In this eastern section of the National Old Trails Road, the route "is marked with red, white and blue bands on telephone poles along the road." Both coincide to Edgerton, where they separate, one following a good graded, well-marked dirt road via Ottawa, Newton, Emporia and Hutchinson, while the other goes via Council Grove, Herrington, and McPherson. While the first follows mostly valley flats, its superior Harvey House system of hotels probably balances the claim of following gravel ridges made by the latter. The route through Emporia was the New Santa Fe Trail organized by boosters in 1910. The other, via Council Grove, was the Old Santa Fe Trail organized by boosters in 1911. 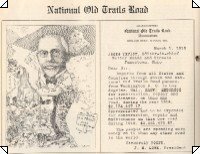 Although the National Old Trails Road Association had adopted the Old Santa Fe Trail as the official route, backers of the New Santa Fe Trail continued to promote their route as superior. It may be stated here that there is no paved road on the route west of Kansas City before reaching within a day's ride of the Pacific Coast, except short stretches near the larger towns, the improvements being confined to grading the natural soil and building bridges and culverts. From La Junta to Trinidad, recent improvements made the road "at least comfortable." From Trinidad, the National Old Trials Road ascended "the convict-built scenic road up over Raton Pass," before crossing the New Mexico state line "over a very winding road into Raton." New Mexico and its neighbor, Arizona, were the Nation's newest States, having attained statehood in 1912. Westgard reported that New Mexico's "newly-acquired statehood has imbued it with a remarkable enterprise and energy in road betterments and other internal improvements." The two States, in fact, were "showing the older members of the family how to be 'up and doing" despite such "natural obstacles in the way of adobe soil, lava rocks and sandy stretches." Three and a half miles west of Bernal it crosses the railroad, and at a fork just beyond one must be sure to take the right fork, no doubt properly signed at this time. Crisscrossing the railroad at different points, the road continued through a series of small towns to Santa Fe, where the motorist drove "south over a good road." Though the road is good, one had better go slow and use extreme caution, with the hand on the brake, because a couple of the sharpest turns, where he may probably have to back up, simply lead into nothing more substantial than atmosphere, and mighty thin atmosphere at that, should the car refuse to stop at the exact spot on an inch ruler where it is necessary to manipulate for the turn. Though assured by the State Engineer that the new road from Albuquerque to Gallup will be open for traffic this spring, I think it might be well, in case of possible delay of the opening of that route, to state here that a fair road leads from Albuquerque to Socorro, crossing a new bridge over the Rio Grande near the latter town, and thence on good-to-fair road via Magdalena across the Augustine Plains and the Datil Mountains to Springerville, Arizona, thence via St. Johns to Holbrook, where it joins the regular Old Trails Route . . . .
To avoid the "difficult Manuelito wash," the route turned northwest along "a good road" to St. Michaels, Arizona. From St. Michaels to Holbrook, the motorist could "cross the river on the new bridge, if finished," or ford the river, "which is usually safe in mid-summer." Either way, the motorist would encounter "some pretty tough going" before encountering "a good road" to Winslow, "at one point crossing on an iron bridge a very deep gash in the earth." Between Holbrook and Flagstaff, the motorist would follow "a new graded road" and a "safe crossing of Canyon Diable and over a magnificent concrete bridge spanning Canyon Padre." The National Old Trails Road followed "the railroad pretty closely on good-to-fair roads" to Topock, where the motorist paid $3.50 to cross the planked ties of the railroad bridge across the Colorado River. Once in California, the motorist would find a "fine road sixteen miles to Needles." A new road, following the railroad more or less closely, leads from Needles 166 miles along the length of the Mojave Desert to Barstow, where it turns south, and soon the motorist descends a splendid highway through Cajon Pass to San Bernardino . . . . From San Bernardino one may either follow the fine highways, 65 miles via Pomona and Pasadena direct, to Los Angeles and then drop down along the coast 131 miles to San Diego or go direct via Riverside to the San Diego Exposition first and then up the coast to Los Angeles. The roads are fine either way. Westgard concluded his tour of the National Old Trails Road with practical advice for motorists considering the trip. He warned that the best months to travel were June through October. He added, "Don't leave the East later than October tenth, or one is liable to find snow on Raton Pass or around Flagstaff." Hotel accommodations were good throughout the trip, with much of the route lined by Harvey System hotels "at convenient intervals." In addition, he said, "Garages, gasoline and oil are available all along the route." Motorists could also take the Lincoln Highway, which "was selected and named by an organization which has for its object the permanent improvement of the route by funds obtained from private subscription and membership fees." They would find the route "well marked in most sections by red, white and blue bands on telegraph poles, fence posts or bridge railings, the letter 'L' being painted in the middle of the white band." He thought, however, that most motorists leaving New York would depart from the designated route and take a northern route via Albany and Buffalo, New York; Erie, Pennsylvania; Cleveland, Ohio; and South Bend, Indiana, to Chicago. Despite at least one section near Willoughby, Ohio, that was "still quite bad," motorists would find this northern route to be "very good." Some macadam is encountered just west of Omaha to Fremont. From this point the tourist follows the valley of the Platte River, on level graded dirt road through Columbia, Kearney and Gottenburg to North Platte, located at the junction of North and South Platte Rivers. West of here is encountered rougher going, relieved by some graded stretches and following the valley of the South Platte River to Big Spring . . . . Proceeding west from Big Spring, the tourist leaves the river and passes through Chappell and Kimball on fair gravelly road, crossing the Wyoming state line just before reaching Pine Bluff. Between Laramie and Rawlins, motorists encountered river routes. The Lincoln Highway followed the shorter route via Elk Mountain. The alternative followed the railroad via Medicine Bow "using some abandoned railroad grades to good advantage." It was 20 miles longer, but was "favored by the state authorities because, it is said, it serves a greater local population." The road west of Rawlins was "good, bad or indifferent, following the railroad" to Wamsutter. After crossing the Continental Divide, the Lincoln Highway avoided "the worst of the very rough Bitter Creek country in the Red Desert, although from Point of Rocks to Rock Springs "one gets a taste of it." The Lincoln Highway was a good "gravel dirt road from Rock Springs to Green River," but was "rough going to Granger." After crossing "some bad clay flats" on the way to Bridger, motorists would find a "good dirt and graded road" to Evanston. At the Fish Springs Ranch motorists are charged fifty cents a gallon for gasoline, should they need any, and it is probable, for they have gone 147 miles since leaving Salt Lake City. At Antelope Valley, the motorist came to a fork in the road. In choosing between the routes via Kinsley Pass and Schellbourne Pass into Step toe Valley, the motorist had "little choice in the two, both are very rough." West of Step toe Valley to Ely, however, the road was good all the way. Now the tourist is past most of the bad going, as the road continuing along the Truckee River between the Virginia and Washoe Mountains is improving as you near Reno, 185 miles from Austin. From Reno to Carson City, the Lincoln Highway was good, but soon took motorists "up King's Canyon grade on a good, but steep and winding road to Glenbrook." Entering California west of Edgewood, the tourist started "to mount the Sierra Nevada Mountains, and it is certainly some stiff climb for the two miles to the summit, 7,500 feet above sea level." Descending, the Lincoln Highway was a "fair gravel road all the way" to Placerville. Between Folsom and Sacramento, the Lincoln Highway changed from gravel to macadam. Motorists would encounter "fine macadam roads" through Stockton and Livermore to Oakland, where the ferry crossed the bay to San Francisco. On the Lincoln Highway, Westgard found good hotel accommodations in most places west of Chicago, but "fair-to-poor" in some areas "and quite bad in most of Western Nebraska and Wyoming towns." However, he found that garages, gasoline and oil were available "everywhere." Because of snow in the Sierra Nevada Mountains from November to May, the best months to travel the Lincoln Highway were June through September. Westgard provided similar coverage of the Midland Trail (New York City to Los Angeles) and the Oceanic Highway (Galveston, Texas, to San Diego) along with brief descriptions of the Pacific Highway and an unspecified route to the Northwest. And, mark this well, carry two three-gallon canvas desert water bags, then see that they are filled each morning. Give your car a careful inspection each day for loose bolts or nuts and watch grease cups and oil cups. Carry two sets of chains and two jacks, and add to your usual tool equipment a coil of soft iron wire, a spool of copper wire and some extra spark plugs. West of the Missouri carry a small commissary of provisions, consisting of canned meat, sardines, crackers, fresh fruit or canned pineapples and some milk chocolate for lunches. The lack of humidity in the desert sections, combined with the prevalence of hard water west of the Missouri River is liable to cause the hair to become dry and to cause chaps and blisters on the face and hands as well as cause the fingernails to become brittle and easily broken. To prevent this, carry a jar or outing [sic] cream and a good hair cleanser. Use them every night.